Moody’s Investors Service expects Malaysia’s fiscal deficit to narrow to 3.1 per cent of gross domestic product (GDP) this year, coming in below the official target of 3.5 per cent. It described Malaysia latest move to reduce fuel subsidy as credit positive. “The move is credit-positive for the sovereign, because it will help reduce the government’s subsidy bill and contribute to its fiscal consolidation,” commented senior analysts Christian de Guzman and Steffen Dyck. However, further reforms will be necessary if the government is to meet its goal of achieving a balanced budget by 2020. The fuel pump price increases are the latest attempt to rein in the fiscal deficit, which the rating agency has forecast will narrow to 3.1 per cent of GDP this year, from 3.9 per cent in 2013. The hike of 20 sen per litre, which constitutes a 9.5 per cent increase for RON95 and a 10 per cent rise for diesel, mirrors the government’s September 2013 reduction in fuel subsidies. The government has also cut subsidies for other items, including sugar and electricity, and will introduce a six per cent Goods and Services Tax (GST) in April next year to broaden the tax base and ease the government’s reliance on petroleum-related income. Moody’s described Malaysia’s overall subsidy bill as having grown rapidly over the past decade, in line with the rise in oil prices. In an earlier analysis, it stated Malaysia’s public debt stock at 54.7 per cent of GDP at the end of 2013, higher than the “A-”-rated peer median of 41.4 per cent. “But combined with our expectations of stronger real GDP growth this year of six per cent, up from 4.7 per cent in 2013, smaller fiscal shortfalls should chip away at the debt stock. 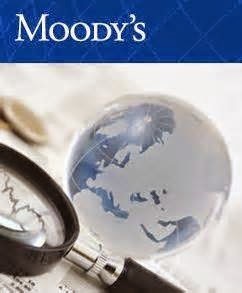 Just like the shift in rating outlook from “stable” to “positive” in November last year, Moody said that expectations of fiscal consolidation and reform and macroeconomic stability are important for any upgrade in the rating. “The next fiscal test for Malaysia will come when the government presents its 2015 Budget on Friday,” it said.